Authors: Poliwczak AR, Białkowska-Warzecha JE, Bała A, Broncel M, Jabłkowski MS.
More than 185 million people around the world have been infected with the hepatitis C virus (HCV), of whom 350 000 die each year. HCV is a now a curable disease, and advances in HCV therapy have resulted in steadily higher cure rates. Therapies based on PegINF are still treatment of choice. However PegINF can induce severe adverse events including cardiovascular disease. A case report. 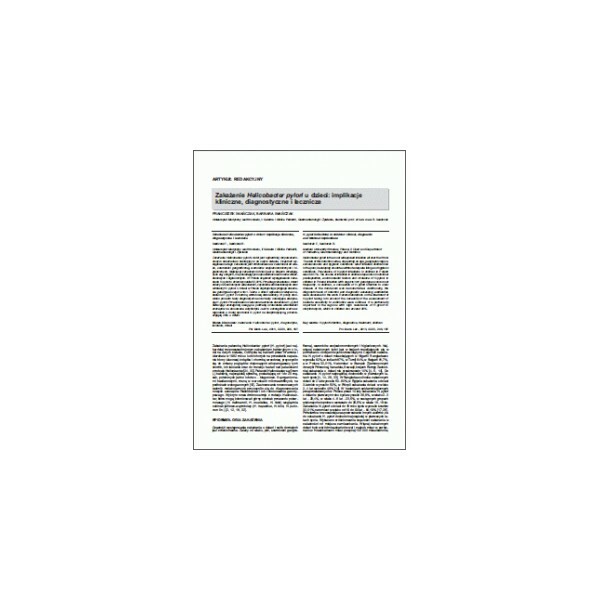 Here we report a 55 year old female patient with the severe hepatitis C and genotype 3 presented with recurring episodes of the loss of consciousness and palpitations in the course of therapy, combining interferon PegINF with ribavirin. During the diagnostics performed the occurrence of non-sustained ventricular. There were no other causes of arrhythmias, such as coronary heart disease or heart failure. It is considered that this is a result of treatment. Because of the confirmed viral clearance completed PegINF therapy at a lower dose, without further complications. Conclusions. The presented case of our patient illustrates very well the level of difficulty of the taken decisions, especially when treatment complications occurred, while also confirming the fairly assistive and supportive role of the non-invasive methods of cardiovascular diagnostics.